A few minutes later, she was on her way to find her mother, when she overheard Mart say, "Bathing suits? Did Trixie say they packed bathing suits? In November? What on earth could they have been thinking of?" "Probably witches and curses and ghoulies and ghosties and things that go bump in the night," Brian misquoted softly. "You know, Mart, I don't like the sound of any of this. No, I don't like the sound of it at all." 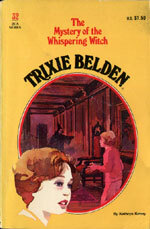 At once, all of Trixie's fears came rushing back. So sensible Brian, too, was worried about the strange happenings at Lisgard House. "And I don't like the sound of it, either" Trixie muttered softly to herself, suddenly sure that there was worse to come. Trixie, Honey and Brian go to the aid of Fay Franklin, a classmate who lives with her mother in Lisgard house, after her mother has an accident. Trixie and Honey reluctantly volunteer to stay with Fay, knowing the house is believed to be haunted. Trixie hears a strange voice warning her to beware and the night becomes one of terror as they believe they are reliving the death of Sarah Sligo, a witch burned to death in the house over two hundred years ago. They flee in the middle of the night and Fay shares her fear that she may be possessed by the dead witch's spirit. The Bob-Whites are sceptical and the female Bob-Whites set about trying to uncover what actually happened the previous night in an attempt to help their friend. Lewis Gregory and Simon Hunter. Lewis plans to burn down Lisgard House for the insurance money and blame Fay. 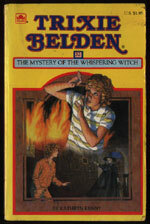 Hunter was paid by him to back up the story of the haunting and Fay's possession. The book is set in November and we later find out, that the story begins on Friday, 20th of November, the week before Thanksgiving. The Friday before would have been Friday, the thirteenth! 'Looking after Bobby was usually a pleasure' (p. 15). This is from Trixie who normally complains about having to look after him! Lisgard House is close to Martin's Marsh and on Glen Road, heading towards Sleepyside (p. 27). Mart, Brian and Jim are involved in a Thanksgiving play. Mart is the stage manager, Jim is Miles Standish and Brian is playing 'bashful John' (p. 134). Di is surprisingly brave in this book and doesn't seem at all perturbed about visiting Lisgard House. She volunteers to go with the others (p. 135) and does a little investigating of her own (p. 152) even after the witch is heard. This is quite unlike the scared, frightened Di portrayed in #25 The Sasquatch Mystery. Di also provided some vital clues by revealing that the furniture was fake (p. 164). Was Honey too scared to notice? It seems strange that the "newly rich" Di, would know more about antiques than Honey. There is a department store in Croton called Ecklund's (p. 166-167).